Winter cross country and road racing. 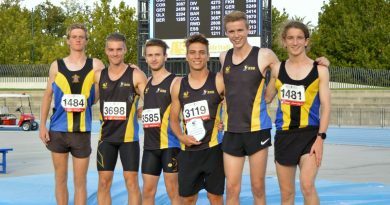 Keilor St Bernard’s fields teams in XCR, which is Athletics Victoria’s exciting winter cross-country and road racing season. From April through to September, athletes pit their skills against runners from all over Victoria on diverse and varied cross-country and road courses. From slogging up impossibly steep hills at Wandin in the foothills of the Great Dividing Range, to attacking the bends and straights on the road racing circuit at Sandown, you’ll enjoy the challenges that XCR throws at you. Winter race day concludes with our traditional Keilor St Bernard’s afternoon tea in which hungry athletes eat their way through mountains of muffins and home-made cakes. Shared rides are organised for these events. There are four underage groups for boys and girls (U14, U16, U18 and U20) and seniors compete in two or more open age divisions. We also conduct a number of club and intra-club events each winter. King and Queen of the Mountain, a gruelling uphill run at Mt Macedon ending with a barbecue at the peak. Bring your warmest tracksuit! The Burke Stobaus Challenge, an annual relay against our traditional rivals Athletics Essendon. This held along the picturesque Maribyrnong River followed by afternoon tea by the riverside. Club handicap over 3k, 5k and 8k, held at Boeing Reserve, Strathmore, a fast event that anyone can win thanks to Ian Upton’s scientific handicapping formula. Easy Saturday afternoons at Brimbank Park. These pack runs are a gentle alternative to official races and end with a sausage sizzle.